Summer is approaching here in the District, and that means outdoor dining. There is nothing greater than meeting up with friends after work for a drink and a bite to eat at one of the many restaurants that have outdoor patios. I always enjoy good food with good friends on warm summer nights. Of course, I love preparing easy and delicious meals that can be enjoyed indoors or out. One of my favorite recipes that is light but packed with flavor is Moules à la Marinière. In English this dish is translated to mussels steamed in wine and flavorings. It is so simple and doesn’t take long to make, but will impress guests. This dish is also fun to make and eat slowly while sitting on the balcony/rooftop, chatting with friends. If you are feeling ambitious, homemade frites (French fries), go really well with mussels! My version of home cut fries will show up soon. Hopefully you enjoy these mussels as much as I do, and cheers to the start of summer! In a large pot or sauté pan with a lid, bring all ingredients but the last two to a boil. Allow the alcohol to evaporate and reduce by boiling for 3 minutes. Add mussels to the pot, cover, and bring to a boil. Every 30 seconds or so, shake the pot around (while keep the lid tightly on) so the mussels move around and cook evenly. Cook for about 5 minutes, until the shells open*. 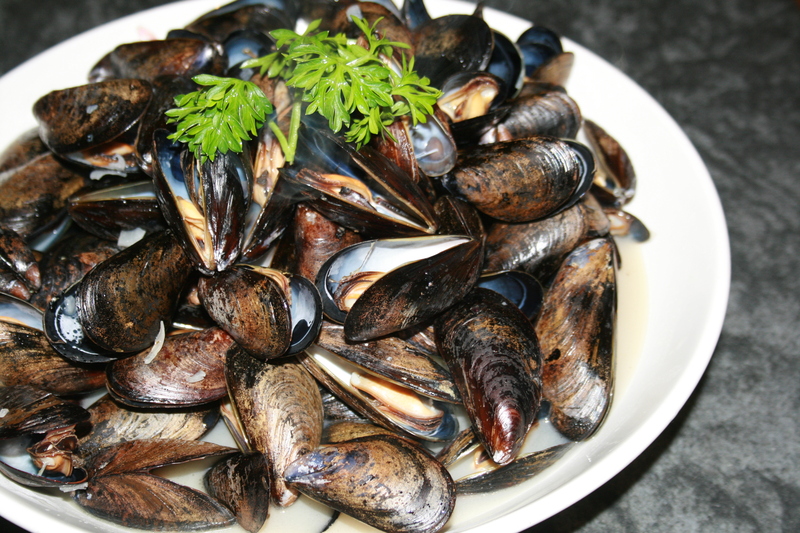 Carefully spoon the mussels into large soup bowls, and ladle the remaining liquid over the mussels. Garnish with chopped parsley, serve immediately, and enjoy! *Don’t forget: any mussels that haven’t opened should not be eaten!